The ECG device detects and amplifies the tiny electrical changes on the skin that are caused when the heart muscle depolarizes during each heartbeat. These impulses can be detected by the ECG machine and helps to find out the cause of symptoms such as palpitations or chest pain. 	ECG 213 can assist doctors to diagnose with the help of auto interpretation function. 	Images are more clear and reliable with color LCD. 	Designed with technology of Digital Signal Processing and Digital Isolation. 	High resolution thermal roll paper is used for recording ECG waveform and prints the record. 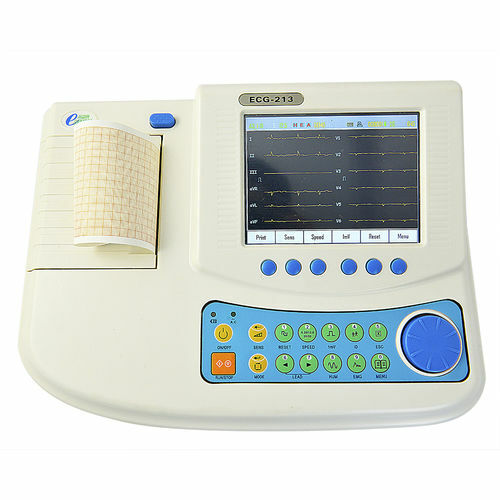 	Prevents control caused by patient's movement by using auto-regulation baseline drift filter and it will auto- optimize the position for printing. 	Auto measurement or analysis system shows the real-time heart rate which makes it easier for doctor's diagnosis. 	Stores maximum of 100 patients' ECG data and enables the user to repeat data and print it from the database. 	ECG 213 can communicate with computer as well as other devices with high-speed USB interface and traditional RS-232 interface. 	Data can be received and displayed by the software provided by the company.